When the recon troops were called to hold the line at Arundel Island, the going got tough. I went with a Marine captain and lieutenant to show them where an American bomber plane had crashed. While investigating the same, a sniper opened-up on us. We searched the area around us but there was no sign of the jerk. The Marines weren’t exactly too brave. I hurt my back when the sniper fired, so I had to miss our next patrol. The boys got two Jap officers, but one of our native scouts got killed. Ybor got a beautiful sword, Passerlie a pistol, Gray a pistol and the Saint a watch. Six got away but we got their food, American rations and New Zealand butter. Sure was good. Lt. Marcotte went out to see the booby traps I set and had the dubious pleasure of getting shot at by a sniper. The bullet made a nice nick in his helmet. Ugli Village was really OK, in time. At full moons the natives came to sing and dance for us. Only the men. We saw their women, and they’re really not bashful. They wear only a cloth below. Up above their breasts stick out like headlights. However, we were warned not to mess around because they have their own ideas how to punish a foolish soldier. Duncan and I went dove hunting, and while there I found four eggs, real chicken eggs, the first I’d seen in ages. So when I got back to camp I got bacon from Mooney and fried all four. Boy, what a treat. After eating dehydrated stuff for so long it was worth a million. Gave some to Gleason – the remainder of my squad – and he has a purple heart. Boy, my boys really caught holy hell. How I missed getting something will forever remain a mystery. Rendova is getting bombed daily. On Munda our boys really hit something. The Japs were dug in so deep our tanks couldn’t blast them out. We had lots of our boys killed and plenty wounded. They finally had to use flamethrowers to get them out. The Japs used to sneak up to our foxholes, drop in a grenade or jump in with a knife to cut or stab our boys. It’s times like this when nerves start to crack. Jake, another of my squad, went nuts and almost shot Sgt. Anderson and Lt. Marcotte. Two deserted us, and now I hear they’re back in the states. Sure a lift to our morale. Dodd, air machine gunner, deserves every credit possible. He stood by his gun and, although in plain view and exposed to Jap fire, kept his gun going. Sorry to say he, too, cracked, and he’s back home. Out of almost 200 we still have 143 men. Our platoon alone lost 13 men for good. When Sherman said, “War is hell” he never heard of New Georgia. Our censors relented, and now we can write home about where we’ve been. It would be pretty hard to let the folks know what’s really here, so most of write only about the good parts – and heaven knows that was very little. Now we’ve been ordered to Banga Isle, a place where quite a few of our boys were ambushed. We had to go on O.P right opposite Munda Airstrip. Here we saw what a waste war is, equipment of all kinds, both ours and the Japs, were all over the Isle. There were plenty of dead Japs and Americans laying around. The boys had to bury them because of the stink. This sure must have been an awful battle. It seems funny to see one of our fellow Americans laying by our feet rotting away, and back home his folks are still believing he’s alive and well. At times one wonders of this isn’t a nightmare. While on Rendova, at Ugli Village, our scouts brought in a Jap they caught. As much as we hated Japs, no one even thought of hurting him. His name was Yatai. He was about 5 feet tall, not too thin, black hair and a corporal. He had awful sores on his feet. We treated his wounds and I got him a cup of coffee. He must have never eaten the way he drained the coffee. We then asked him questions galore. For answers we got nothing. We gave him this pen and he wrote his name and other things in Japanese. We turned him over to G-3 for a going-over by Jap interpreters. If all Japs treated our boys like we treated Yatai everything would have been O.K. I got a silver ring from Roberto Nenga, an ex-cannibal, for some cigarettes. He’d caught some Jap washing clothes, so he sank his tomahawk in his head and took the ring. Nice fellow. I got him and the chief to promise to keep Pap’s grave fixed-up, and if I know them, I’m sure their word is as good as gold. After our Banga O.P. we were ordered up to Arundel Isle next to Kolombangara. The north end was still in the hands of the Japs. We went on daily patrols but saw no action. We investigated about 50 isles around Kolombangara for any possible Jap O.P.s. On Kolombangara there’s an estimated 10,000 Japs trying to evacuate to Chiosel or Bouganville. Our air force was sinking barges by the score. Our 155 mm long rifles were hammering away at them day and night, and we heard the shells going over our heads whistling on their way. Pistol Pete, our name for Jap artillery, opened up on us fairly often. Good thing he had a lot of duds. Our C.P. on the Diamond Narrows is directly opposite the new airstrip the Sea Bees are building. They’re having trouble up north with the Japs coming over from Kolombangara so Third Platoon is set up there, and our platoon goes on the secondary line. Have Otto in my foxhole right by the barbed wire entanglement. 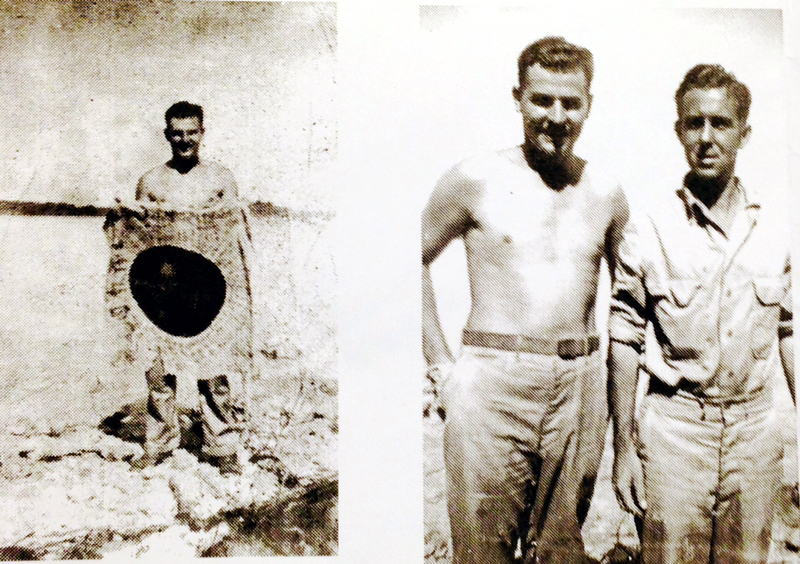 The 3rd Platoon reported five wounded, including Lt. Atkinson, and three shell-shock cases. They really had a tough time up there. Jap snipers were all over, and they tossed grenades in our holes all nite. It’s a good thing their knee mortar ammunition isn’t too good. Our 155s were hitting close to the lines too, boys really had their tails dug-in. A new mortar B.B. came up to try out their new 4.4 mortars. They’re really lulus. On our line we stood 24-hour guard. For two men in a hole, that’s really hell after a while. Here’s where we had air raids galore. We had no anti-aircraft guns, so the Japs came in and bombed away at their leisure. We had 21 raids one nite. It’s really an eerie feeling to hear the planes dive, then hear the bombs whistling down at you. Then’s when you pray and hope for the best. One big 500-pounder hit about 200 feet from us. The only casualty was a big bat killed, and the Saint got a bloody nose. We finally got Arundel secure, so we were relieved by the 172 boys. Sure was one hell on earth for a while. From that secondary line we moved to the C.P. for a while. There was no bombing, but Pistol Pete came awful close. Then the whole troop moved to Banga again. There was plenty of work policing-up and fixing-up our new area. There were still plenty of air raids, in spite of night fighter planes and anti-aircraft guns. We got all of Kolombangara on the 6th of August without firing a shot. So now I believe Bouganville will get it somewhere around the 25th. We’ll probably have to take over Chiosel, too, because it probably has some Japs from Kolombangara there. It’s rather discouraging for us not to get a rest. From all indications we’re here for the Bouganville push, too. Nice future ahead. Now I’m in charge of O.P. I have four men, Shein, Otto, Mike Lajoie and Gagmon. We missed the first movie because of O.P. It’s been a long time since I’ve seen one. I let Gagmon and Otto sneak back to see it. Shan, Mike and I rowed over to see our second movie. It sure was nice to see one after five months of nothing. Our second week on O.P. we had a peach of an air raid last night, Oct. 29. Heard these damn bombs whistle down past us again. I have two nice skinned elbows from hitting the dirt. The rumor is that Bougainville is about to change hands any day now. Hundreds of planes keep going back and forth to bomb the hell out of the place. I sure am glad I’m on Uncle Sam’s side. We can get Welch’s Grape Juice now at the P.X. I should have a schoolgirl figure soon, according to Irene Rick’s promises over the air. We’ve had a few more air raids and a few more eggs laid but little damage was done. We’ve been relieved of O.P. duty and now we’re back in camp. After three weeks of being on your own, camp routine is kind of tough. There are rumors of Bougainville getting hit twice now, according to Lt. Dall. They hit three isles nearby and now Bougainville itself got it. Tonight’s rumor has the Jap navy catching hell; I hope it’s true. It’s going to be kind of tough getting the Japs out of Bougainville, but we’ll get’em before long. We can have lights on now at night, so we can see to read or write. I’ve been working on a seaside latrine – cool breeze for your cheeks while you’re doing your business, and since the ocean tide goes out you never even have to flush the damn thing. It’s very convenient, to say the least. We worked on the rifle range today, Nov. 2, and went on “patrol problems;” we had men shooting Jap weapons over our heads while we tried to spot their positions. It was very interesting, but darn hard. At least we had no casualties. Then we saw a very good movie, “Yankee Doodle Dandy.” The next night we had one beaut of an air raid – our guns really went to town. We started getting our Christmas packages Nov. 3.We’re still getting a few air raids. The other night our gunners threw up everything but the kitchen sink at the Japs They really screwed away, too, after that reception. Pass, Mike, Gagman and I represented our platoon at the dedication of Munda Cemetery. It was really a beautiful sight, and one to remember. They gave a 21-gun salute for the dead from each outfit. I sure got a funny feeling when we heard Pap’s name called off as being the first killed in our outfit. They had newsreel men taking photos of the whole ceremony. Later we saw a movie again at the Marines, Fred Astaire in “The Sky’s the Limit.” It was very good for laughs, and the gal with him sure had her bumps in the right spots. What a picture to show us here. Most of the fellows got sick and had to be rushed by boat to Munda. They got ptomaine poisoning. I guess I was lucky because I didn’t get too sick. Neuman is going to Munda today to get a checkup. His nerves are all cracked, and gunfire affects him too much. I believe he’s due for the states. War neurosis. The poor kid had tears in his eyes when we shook hands with him, and with Pap gone it looks like the old gang is all busted up. Bombers and planes of all types are going back and forth to Bougainville. The Japs are really getting a pasting. We saw another movie last night. The trip to Kolombangara was called off due to ptomaine poising for half of the troops. We’re going to patrol Kolombangara tomorrow. I shot an .03 rifle today to qualify for team and got two bull’s-eyes out of three shots. We went over to Kolombangara last Wednesday and returned Friday. We went on patrol over nite and saw plenty of bivouac areas and strong pillboxes, plus big guns on the coast. Lt. Marcotte and Johnson’s patrol saw fresh Jap tracks near the waterhole, which proves there are still Japs there. My squad saw nothing. We had to carry H2O over five miles in five gallon cans, quite a trip. I got nine more packages Friday and Saturday saw a movie. 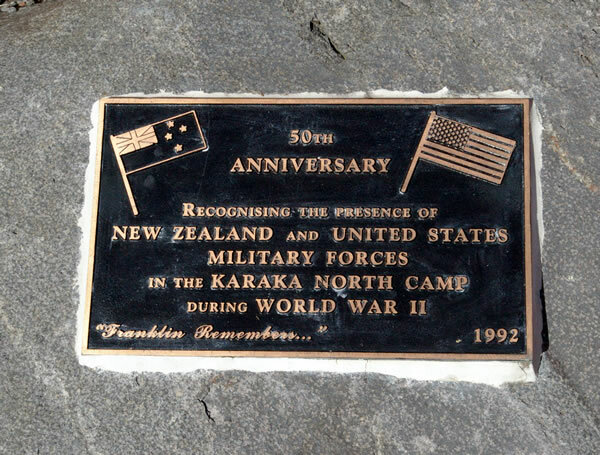 We’re hearing strong rumors of going to New Zealand to reorganize under Gen. Kreuger. A fine future in store if that’s true. We saw a double feature Saturday and played softball at Geary Field on Munda. We lost 7-1… to the M.P.s, of all people. Our softball team was still on the losing side, we lost two more. Lots of movies lately. We’ve been hearing about a few Jap diaries that were read. Very interesting. They all knew they were doomed. I saw a P.40 go overhead, the motor missing something awful. I heard it crashed. I hope the pilot is safe. The report is he has hit while up in Bougainville. We’ve been seeing more movies, some a waste in taking-up cargo space. Packages are coming in very nice. I have more candy than I know what to do with. The rumors are strong now for us going back to Caledonia and, eventually, on to New Zealand. We hear the Japs are taking a beating up in Bougainville and elsewhere. I got word my flag finally got home. Boys were on O.P. again, my turn next month. There’s plenty of rain and wind but it’s sunny again now. We heard a 103 7G band play pretty good. I had to drop out of the softball league, there is no field for practice. Our basketball team beat the Navy 24-12. Violet wrote a very nice letter. Now all I need to do is relax again. We’ve been seeing a lot more movies and our basketball team’s O.K., only the damn Marines can beat’em. On Christmas Eve we sang Christmas carols, then put on a show of our own, really had some fun for a change. I’m playing a lot of horse shoes, and have a lot to desire in my playing. Christmas Day was spent very quiet again. That is, for us. Our bombers really went up to visit the Japs in full force. Today, Dec. 26, we’re to see a USO show. I have my fingers crossed, because they’ll probably be some outcasts from Hollywood. Part of the 1st Platoon is going to Wana Wana on O.P. duty. That’s where the dusky maidens cavort at dusk, but from rumors we hear they’re too hot to handle – that is, the consequences are. I just got back from the USO show. Three men, one played a swell accordion. Buck Harris, ex-cowboy Hollywood-style, sang and played guitar and a big, fat guy sang quite a few nice songs and he was really O.K. One was Bob Dearborn and the other Paul Baxter. I believe I’ll get a five days leave to the Russell Isles. Rumor has us going direct to New Zealand. I believe our new Lt. Johnson is going to get the heave-ho to another outfit. Strictly G.2. We saw two movies Monday. “Keeper of the Flame, Tracy-Hepburn and “Edge of Darkness,” Flynn –Sheridan. 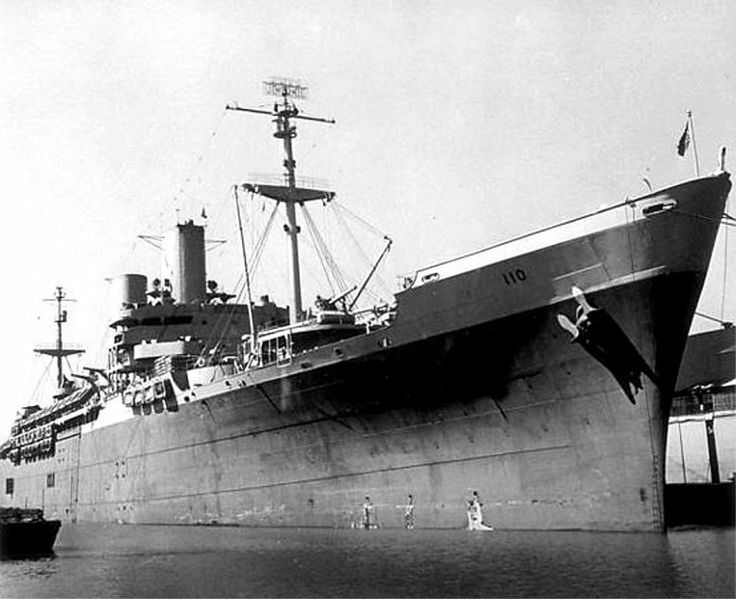 The Marines hit Cape Glouster, New Britain with no casualties. Marines relieved on Bougainville, all Army now. I’ve just been informed that I’m to get a Good Conduct Medal. Also got two cans of beer per man. Mail O.K. — more damn candy that Saunders in Detroit. Well, 1943 finally went where all good years go. According to news commentators, 1944should see the end of hostilities. We had our annual turkey dinner. Pretty good. It seems funny we can have it once in a while and can’t have it oftener. Notes from a son: The events that happen next and those that follow pretty much shaped the rest of my father’s life. This was the beginning of a long-term and untreated case of PTSD, the foundation of a deep rage that lived in him just below the surface. He never left the house if he could help it on the Fourth of July. He didn’t watch war movies. I wasn’t supposed to play with toy guns around him, or have friends over because they’d make too much noise, or startle him. Ever. He hated fireworks, allowing them only occasionally. His July 4th, like most other nights, involved a lot of Phenobarbital. He shared some of that annually with our freaked-out beagle-basset, dachshund-schnauzer dog, who also hated July 4th. When I first read this journal at age 16 I didn’t comprehend the magnitude of what I was reading. Transcribing this section now at age 51 after decades of studying military history was like watching a train wreck in slow motion. So here we are, at that point in the 1940s-vintage Hollywood war movie when the hero is supposed to find great glory. Former Pvt. And now Cpl. John Steve Moses was an untested and low-level leader in an Army Recon demolition squad that had just been moved up for its first real action. The date header was changed from June 12, 1943 to Oct. 7, 1943, because he checked the notebook in with his personal belongings before moving out to combat. This was his first chance to record what had happened. He might not have known that this was called Operation Cartwheel, a battle to take Munda that would last into August and cripple the Japanese air operation http://www.historyofwar.org/articles/battles_munda.htmls . The reason the date was changed was because I just now got back this diary. I had it packed away because we were moving up to New Georgia to see just how tough the Japs really are. I’ll begin with July 2, when we loaded onto an L.S.T. Sure had fun with those 105 shells. We started out in early evening, and a choppier sea would be damn hard to find. We really had our ups and downs, and I was a bit seasick and pulled Corporal of Guard from 11 p.m.-2 a.m. That was hell in itself. Our convoy was spotted by the Jap fleet and only God himself helped us get away. We headed back for the Russells during the nite, but at dawn we again started toward Rendova. We stayed in Wickham Anchorage all day, exposed to any Jap recon plane, but luck again was on our side. We started out to Rendova again and this time dawn found us in Rendova Harbor. Our 155s were already zeroing-in and we could see dive bombers blasting the hell out of Munda Airport. This was July 4th, the day to celebrate back home. Believe you me we certainly got our share of fireworks. Immediately after lunch while still onboard ship waiting to unload, a nice formation of bombers came over the mountains of Rendova. I counted 16 and for all we knew they were ours, but when all our guns and guns around us started shooting, we knew we were in for some fun. Bombs fell right alongside our ship, six in a row. I dived underneath a truck but I was no safer there because after the raid was over I saw the truck was loaded with T.N.T. It sure was something seeing those big bombers get hit and blow up in the air. One had his tail shot off, and floated down for what seemed like ages. There were burning planes all over the place. I saw the first shot our boys fired hit the first Jap, and down she came. This was the first time these Navy boys ever saw a Jap plane, and they really did damn good. The final score was 13 knocked down and our fighter planes took off after the three that got away. Never heard how they made out. Note: An official tally counted 12 planes shot down by anti-aircraft fire. The 16 were part of 100 bombers that had started out to defend Japan’s Munda installation. The others didn’t make it to the battle. After the raid we saw the Japs had hit the ammo dump and quite a few Sea-Bees and sailors. One had both of his legs blown off, the other had a hole in his back you could put both of your two fists in. He died about an hour later. Also had quite a few shell-shock cases. Our Captain met us and we loaded onto two small barges for Ugli Village to relieve the 172 boys who were up that way on O.P. duty. Upon nearing the place we saw some men running around on the beach but no one seemed to know who they were, so we headed to the pier of the village. We lowered the ramp and went off about 100 yards to put our packs down so we could unload the barges when all hell broke loose. God only knows how I got behind a big hunk of coral right on the beach. Jap bullets were whistling right over my head, and where they hit close, pieces of coral really flew. Most of the boys were still on the two barges, so they fired their m.g.s as best they could, but most of the time we were in between two lines of fire and in equal danger from both. Pap Morrel was by me when the Japs opened up and got hit in the gut. Seeing as how he fell on the beach where the Japs could still see him, Shanahan and I crawled over to him and pulled him where we were. Boy, those bullets came close. On checking-up I saw Shan didn’t have a gun, Allen lost his and Keith besides me had only his .45 pistol. I almost had to knock him out because he had the damned thing aimed at me and I was in more danger from him than I was from the Japs. I had a couple of clips from my Tommy gun and got ready to fire. Upon pulling the trigger I found the damn thing wouldn’t fire, so that was really nice. All I could do was hug the sand and listen to bullets fly over my head. Saw G.J. Collins get hit in the leg when he tried to get to the barge and also saw D. Senna get hit over the left kidney. Poor kid really had a gaping hole there. As for medical aid to Pap, all we had was some sulfa powder we sprinkled on. He really was in a bad way. Senna was again exposed to enemy fire, so Gray and I crawled over to him and dragged him out of the water. Couldn’t do a damn thing for him. Sure is something to hear the two boys moaning, and all we could do was pray for them, and us, too. Sgt. Anderson was going on the barge, so I took his Tommy gun. Imagine how we felt when the two barges took off and left 7 men stranded on the beach. Had about 11 men on the other side who crossed the river when it started getting dark. They thought we were on the boat, so they never even bothered looking for us. About an hour later I heard a noise on the pier. It was kind of dark, but I could see a big Jap outlined against the sky not more than two feet away. He evidently thought we were gone because he wasn’t too curious. He kept poking his bayonet into the shadows, and when he was coming too close for comfort I decided to shoot. I had the Tommy gun on full automatic and aimed for his guts. I squeezed the trigger, but, again, my second Tommy gun failed to work. Luckily for me and the rest he didn’t hear the gun click because the surf was too loud. After a time he finally decided to go away. By that time I wasn’t in the mood for anything. The Thompson is a wonderful weapon, but for me the things are a jinx. After it really got dark I decided to try and go and see if we could get help. I knew the boys were somewhere around. Couldn’t go across the river because I honestly believed that, too, was held by the Japs. So Glen and I took off and sneaked around the pier for the ocean. Shan didn’t have a gun so we gave him Gray’s “03.” That left us with no weapons at all. Gray and I swam fully-clothed down the beach about half a mile, went past our own guards and as luck would have it no one spotted us. We crawled on the beach and decided to stay there until morning. It started raining and, even though we were in the tropics, we were cold. We huddled close to try to get warm but gave it up finally as a bad job. At daybreak July 5 we moved and hid along a trail. Gray slept while I guarded. Heaven knows why, neither of us had any weapons. I saw four men go past, but it was too dark to see whether they were ours or not. About 10 minutes later I saw a few more go by, but I didn’t take a chance because I still couldn’t see for sure. When it got lite I heard noise again coming down the trail. I crawled closer to see for sure and when I saw the U.S. canteens on the web belt I yelled at them. Imagine our surprise when it turned out to be our Capt. Dall, Lt. Marcotte and some 172 boys on patrol. The captain sure was surprised to see us. When I told him there were five more men behind he sent out men to find them. Pap Morrel was already laying on a table when I came back. I tried to cheer him up and tell him he’ll be O.K., but he only smiled and didn’t say anything. He died a few moments later. I couldn’t quite realize he was gone. In fact, things happened so fast I doubt any of us even knew what was going on. Gray, Todd, Gagman and I dug Pap’s grave. That was the one of the hardest details I ever had, or in fact any of us had. All of us there had tears in our eyes because Pap was a man anyone could be proud to call a pal. To Newman and me he was like a brother. They’d found Newman, Garret, Shan and Allen when they went to look where I told them. They were O.K., but Senna was hurt pretty bad. “Hollywood” Holmes got hit with the other bunch and Echols and Otto Gleeson caught some ricochet bullets. None serious. The boat came back at about 10 with Lt. Hall. The rumor back at Rendova Harbor was that we were all dead. And it was only with God’s help that wasn’t true, because later on we captured a Jap who said there was 90 Japs there on the 4th fighting against 7 of us left on the beach and 11 who crossed the river. Set up “booby traps” all around camp and dug in 2 men to a hole. I teamed with Newman. We took turns at guard at nite and heard Japs yelling in the jungle. We saw lites on the island across from us. Porky Wishard opened fire and the Japs screwed-off. Left signal lites and equipment by the barge they left grounded in the canal. It really was some nite. Men were panicky, shooting at every sound. I didn’t fire, but I can say I wasn’t feeling any too good. After our initial encounter with the Nips we saw them every once in a while, but they never did even try to come close to our area. Had two patrols out daily to recon the area, but they were up in the hills, so no one had a bit of rest. 2nd Platoon ran into 13 Japs and believed they got them all. 1st Platoon came to reinforce us and they were more than welcome. After 2 weeks they were off to Munda, but before they left they ambushed one Jap. About 14 got away. 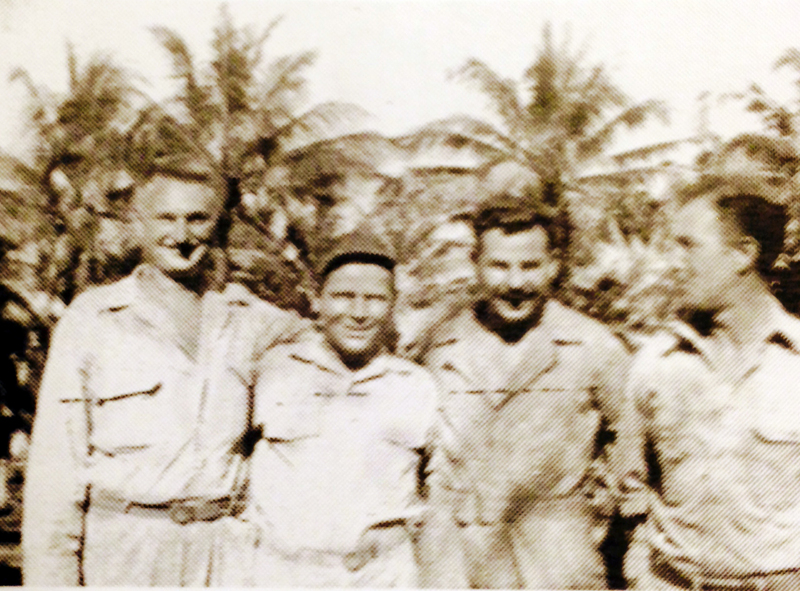 Lt. Marcotte, Kal and I took our squads and went out with natives to scout an area where Jap tracks were found. After walking about 6 miles we found fresh trails so we sneaked in and saw 8 Japs in and around a lean-to. Kal’s squad went to the left, mine went to the right. When we opened up it was really a sight to see these Japs get hit. Two of them opened up on us but they didn’t last long. One not too anxious to meet his ancestors took off to my right. Took one shot at him with Pap’s rifle and had the satisfaction of seeing him hit the dirt. Left: Cpl. 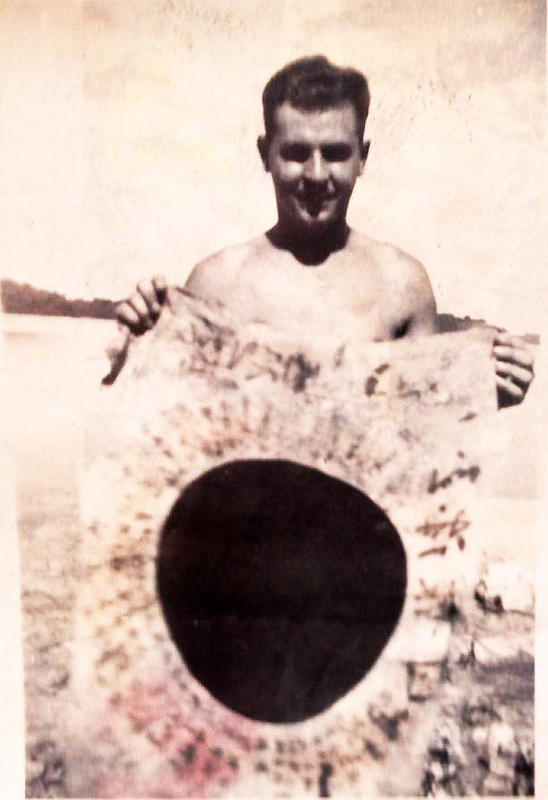 John Steve Moses holds a captured Japanese battle flag. Right: Making friends with the Aussies, likely in New Guinea. Our total was six Japs dead, two wounded that got away. I got a flag, a bayonet and a small radio from there and numerous other souvenirs. But Capt. Dall turned my radio in to the signal corps, so there went the best thing I had. We felt pretty good when we came by Pap’s grave. Newman and I made a cross for Pap, carving in his name, July 4, 1943 and Chester, Pa, his home town. I bet his folks were really shocked to get the news. and a detachment of heavy weapons in security of Zanana. with only minor artillery opposition during the boat movement. covering the right and rear of our advance.